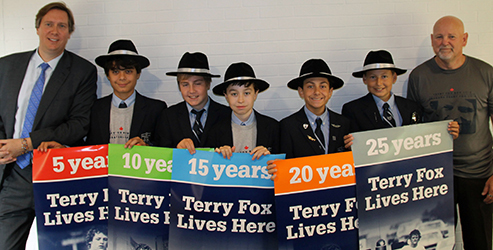 Fred Fox was our guest at Assembly on September 10, and shared his brother Terry's message of courage with a gymnasium full of boys, faculty, staff and parents eager to hear about a Canadian hero's journey. Fred provided enthralling accounts of the lives of the brothers, explaining how Terry persevered in every single pursuit until he found success. Fred reminded us that Terry was average in every way, but special in that he never gave up. If ever there was a story of inspiration, it is the story of Terry Fox. Fred Fox was at Assembly to kick off our Terry Fox Foundation fundraising drive as we celebrate 25 years of SHS's Founders Day Terry Fox Run. This is a favourite event for the Sterling Community! Old Boys, parents, students and alumni parents, grandparents and family dogs all come out to join us as we walk and run laps around our school. The Sterling Hall School remains the top fundraising elementary school in the WORLD having raised $1,458,588 since 1993. DONATE HERE to support SHS's Founders Day Terry Fox Run.